(RRP £399.99). Fabulous quality - women's straight leg leather trousers jeans superbly tailored in extra soft finest quality real genuine nappa leather. They sit a little below the waist (mid-rise), styled as hip-hugging hipsters with waistband and integrated belt. Long leg but easy to shorten. Exquisitely tailored by Ashwood exclusively for Tout Ensemble to our own design. Available in black and light navy/blue. Please see our Product Description below for full details and important sizing information. (RRP £399.99). Just exquisite! These are extra special womens leather trousers for smart wear. They are made in sumptuously soft semi-aniline leather. This is a superior nappa which is less processed and therefore a more natural soft leather. A classic style, the leather trousers are slim-fitting, superbly tailored to fit at the waist, with a waistband, and follow the curvature of the body with a smooth line. By Ashwood. (with or without belt loops) Please see our Product Description below for full details and important sizing information. 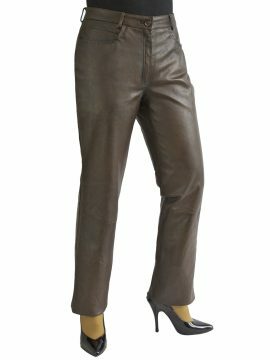 A great pair of figure-hugging ladies/womens black leather trousers in a jeans style, made in fine quality lambskin nappa leather that has been given a special glazed finish for extra shine. The trousers have a waist-high waistband. with belt loops, two back pockets with stitching detail and two front pockets. There is a front zip fastening with a button in the waistband. 3/4 lining down to below the knee. Made for Mana from Ashwood. Please see our Product Description below for full details and important sizing information. (RRP £399.99). 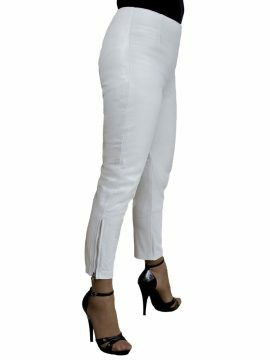 Beautifully tailored, snug-fitting ladies leather trousers jeans with straight leg cut, made from fine quality buttersoft lambskin nappa. Front pockets with stitching detail on edges, waistband with belt loops. Front zip and button fastening. Made by Ashwood. Please see our Product Description below for full details and important sizing information.